Earnest Lowell Freeman, age 83, son of Roy and Julia (Brown) Freeman was born October 11, 1935 in Salem, Mo. He passed away December 24, 2018 at Houston House in Houston, Mo. Earnest is preceded in death by his parents and all of his brothers and sisters but two living brothers Gerald and Frank. He was one of 11 children. He is survived by children Mona Fields, Buddy Freeman and wife Kay, David Freeman, Rusty Freeman, Rose Jett and husband George, Mykel Freeman and wife Laura, Susan Freeman, Philip Freeman and wife LeeAnne, Sherry Glascock, Christine Brazier and husband Buddy, Crystal Turrubiates, Julia Freeman and numerous grandchildren, great-grandchildren, nieces, nephews and cousins. Earnest attended grade school at Black Oak and later received his GED. He also obtained a welding certification. He was a certified welding and mechanic in the Air Force for 4 years. He also worked as a welder, mechanic, bus driver and other various jobs in his lifetime. 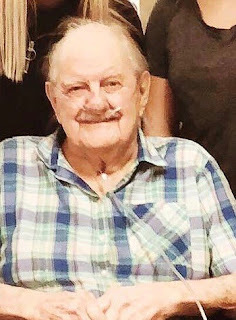 His hobbies included working on cars and lawnmowers until he was unable then playing cards, listening to blue grass music and watching old John Wayne Movies. His best friend for most of his lifetime was Boty Moss who worked for Paramount Pictures in California. Earnest had a playful personality and giving heart. He loved his family and will be missed by all of those who knew and loved him. Earnest wishes were to donate his body to science as two brothers had previously. The family plans to hold a memorial service at a later date. Arrangements were under the direction of Evans Funeral Home.